An avalanche in the Hatcher Pass area started by a moose is an indicator of heightened concern for further slides in Southcentral Alaska, according to avalanche forecasters. 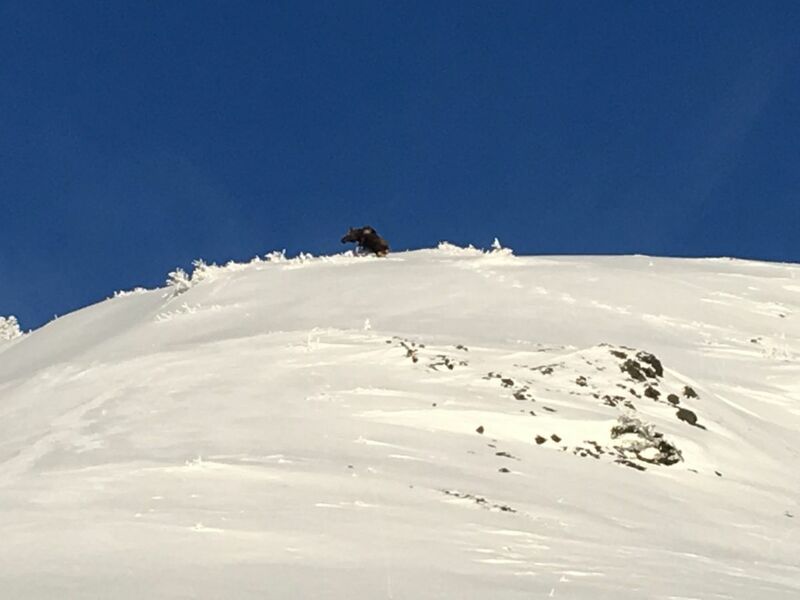 An online report of the avalanche at about 3 p.m. Sunday on the lower Arkose Ridge, written anonymously by a witness and accompanied by photos, said they accidentally spooked the cow onto a steeper slope at an elevation of about 2,200 feet. "Within seconds of the moose traversing off center of ridge, to the west, the entire slope gave way with an enormous force, propagating to the northwestern face," the witness wrote. "Hopefully (the moose) didn't get buried and managed to ride it out to the lower slopes where I couldn't see." The witness wrote that they unsuccessfully tried to find the moose after the 1,000-foot slide but wasn't properly equipped to dig the animal out. Jed Workman, director of the Hatcher Pass Avalanche Center, said he was told that the moose survived the fall but he didn't have details. He said the slope where the avalanche occurred, on the Palmer side of the pass, was "sort of a unique area." Workman said he texted with the witness. "It's not typically an area that gets traveled by backcountry users," Workman said. "This person had exited their property and climbed the hill and had this encounter." The Arkose Ridge report was one of five avalanche observations posted Sunday from the area, including one that a snowboarder was caught in avalanche runoff near the Fishhook parking lot but "managed to ride into a clearing." The avalanche center reported considerable avalanche danger in the pass at elevations above 3,500 feet for the weekend, as well as moderate danger between 2,500 feet and 3,500 feet. During the same weekend, a man died in a slide near Cooper Landing on the Kenai Peninsula. Alaska State Troopers said Tyler Kloos, 29, was killed Saturday when his snowmachine was caught in an avalanche roughly 2 miles from the Snug Harbor Road trail access. Wendy Wagner, an avalanche forecaster at the Chugach National Forest Avalanche Information Center, said unstable conditions were still in place across Southcentral Alaska following a storm last week that brought snow and a melt-and-chill cycle to the region. Turnagain Pass has had a relatively stable snowpack, Wagner said, but many areas to the south have been markedly less so. "We're telling folks that there's a heightened avalanche danger, and the problem we have doesn't go away right away," Wagner said. Avalanches like the one on Arkose Ridge have been particularly hard to predict, according to Wagner. "These types of avalanches are breaking under the snowpack," Wagner said. "It can be tricky because it can lure you onto slopes, and you might not see any signs of instability until you trigger an avalanche." Wagner said forecasters are also getting word of conditions ripe for "remotely triggered" avalanches, in which disturbances to snow at markedly lower elevations begin a slide. "The other thing that's tricky is that you can trigger an avalanche from midslope or even the bottom of the slope," Wagner said. "That's where the weight of a group of people, a snowmachine, hits just the right spot and collapses part of the snowpack at the bottom." An advisory posted last weekend on the Hatcher Pass Avalanche Center's website warned of persistent weak snow layers beneath the current snowpack – a factor that makes slab avalanches similar to the moose-triggered incident more likely. "The snowpack has now had a chance to adjust to the new load and natural avalanches are not likely, but they are possible, and human-triggered avalanches are likely," forecasters wrote. "Unfortunately, our flawed base of weak snow is continuing to produce avalanche problems. We are not out of the woods yet." 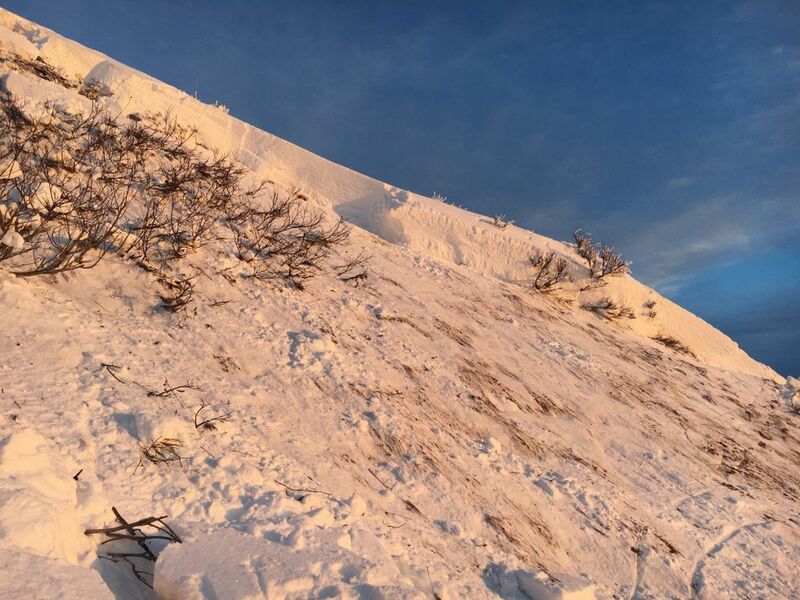 Workman urged people planning to visit Hatcher Pass this weekend to monitor weather forecasts for new snow or high winds, both of which intensify avalanche concerns. The weak snow beneath means avalanche danger levels in the area are likely to remain elevated. "We're just tracking between considerable and moderate, because at considerable it's likely that humans trigger avalanches," Workman said. "You can look to the future and know with this weak layer that we're going to keep having problems."